The big one. Blizzard of ‘78. Dayton comes to a standstill. Brought to us not by Mother Nature but by a legendary Yeti named The Abominator. He passed through town and snuggled in for the night. Unknowingly turning our town into snow, ice and cold. But all was not lost. To make up for the city’s misfortune, he left a batch of Doppelbock behind to warm the hearts of those in need. 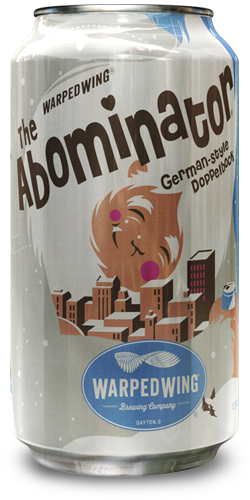 The Abominator Doppelbock. A German-style lager with a nutty, bread-like aroma. Mild sweetness from the warming hints of caramel. And a clean, rich, malty finish. Stay warm my Yeti’s. Warped Wing is a proud member of the Independent Brewers Association and a supporter of good local brews everywhere. Warped Wing is a proud member of the Ohio Craft Brewers Association. Share a Pint, Make a Difference is our way of giving back to the community. Every month, we partner with a local non-profit organization. Between 5pm and 8pm every Tuesday, we donate $1 for every pint sold to that month's non-profit organization. © Copyright 2019 Warped Wing Brewery. All Rights Reserved. When do you need your keg(s)? We only provide tours on Sundays. Please only request a date on Sunday.